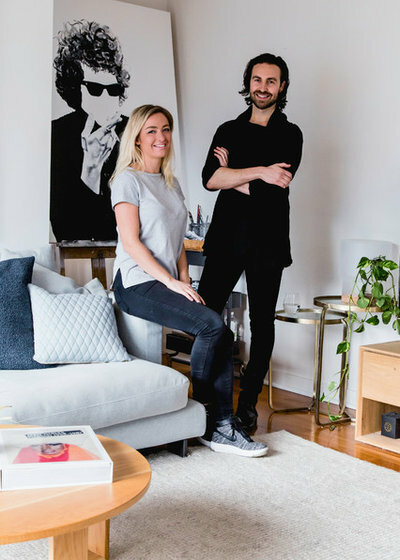 Meet stylist Rebecca Astrinakis, a co-founder of Nathan + Jac, and her husband, artist Adoni Astrinakis. 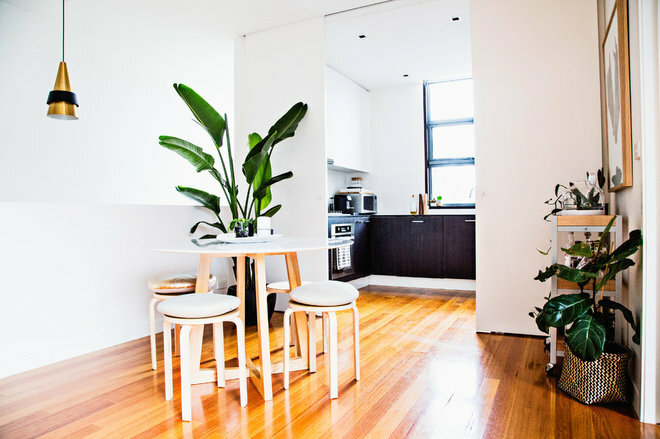 Their modern rental apartment near Melbourne, Australia, boasts natural light, rooftop views and an open-plan layout. Rebecca has used her stylist’s eye for detail in decorating the apartment. 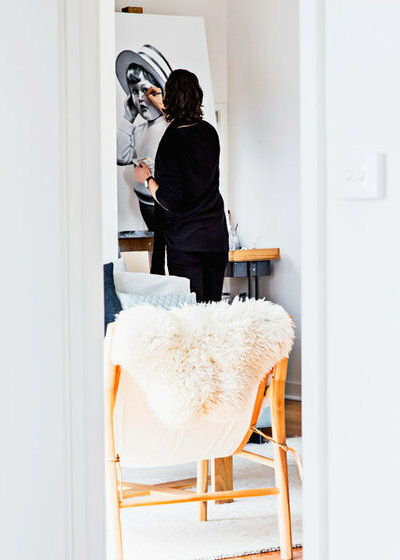 Adoni’s bold artwork adorns the walls, and he often uses the main living room as his art studio. 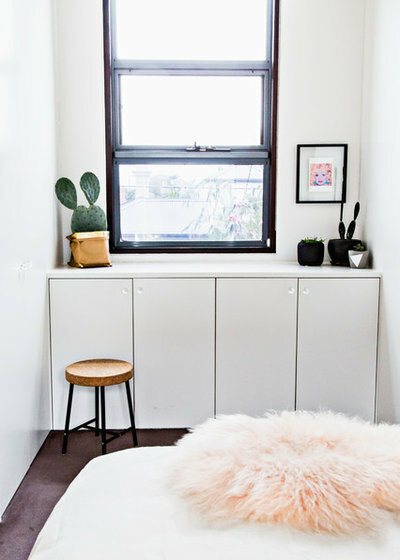 Together, they have customized the compact two-bedroom space. 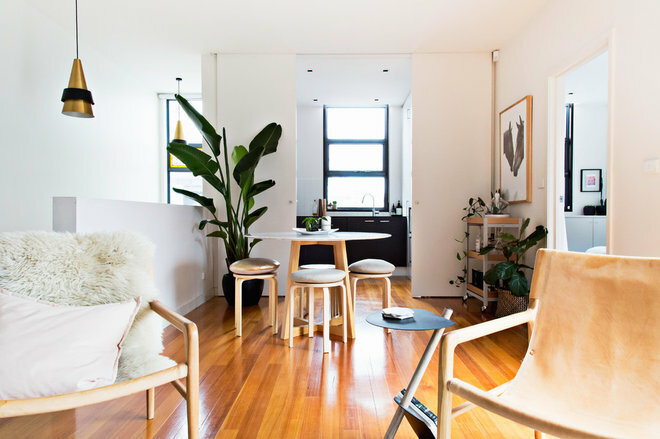 Upon first inspection of this Justin Architecture-designed apartment, Rebecca and Adoni knew it would suit their creative lifestyle and needs. “We love the area — you can walk to the beach, cafes and Chapel Street, and both our sisters live just around the corner,” Rebecca says. The apartment is small but not restrictive. It boasts a bright and open living space. In the afternoon, light floods through the west-facing kitchen windows, which later provide a view of the sunsets. Adoni has an easel set up in the far corner of the living room. Dylan, a 2013 artwork that hangs as the centerpiece of the room, was his first painting. It launched his career and is now displayed as a memento. 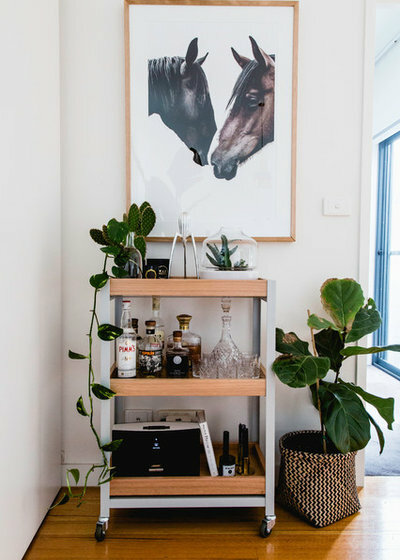 Kiss Cuddle American Oak coffee table: Mr & Mrs White; pillows, antique brass nesting side tables: Nathan + Jac; Ethnicraft entertainment unit: Globe West; Sierra wool rug: Armadillo & Co.
Having the flexibility to work from home is important to the couple. 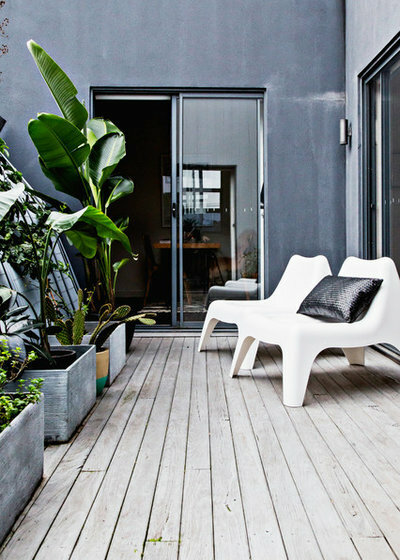 Utilizing space to its fullest is a key design consideration in apartment living. These sliding doors connect the spaces when they’re open, but they can be closed to create separate areas. 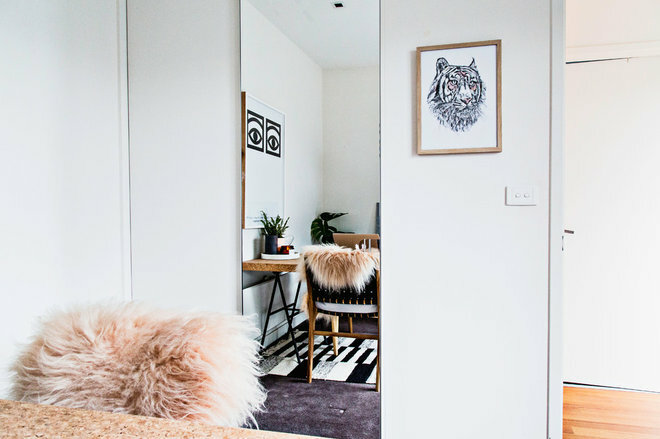 “Our apartment is small but so cleverly designed that it actually fits in a lot!” Rebecca says. One of the couple’s favorite pieces is this marble dining table from Globe West. 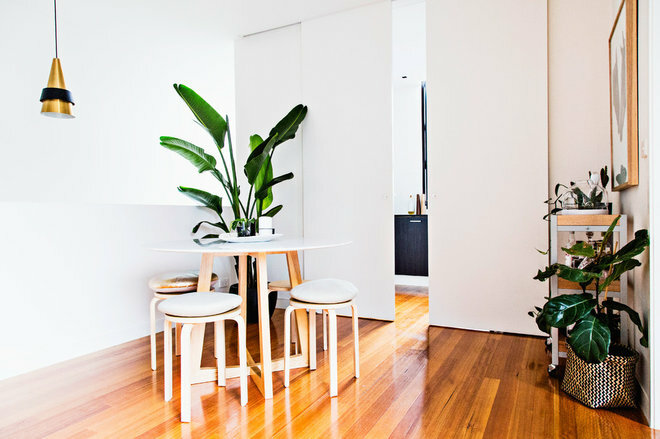 “I’m yet to find the perfect dining chairs for this table and had placed these Ikea stools around it as a temporary option, but after living with them for a little while, I actually like how the stools create an openness,” Rebecca says. The vintage decanter and glasses were gifts from Adoni’s mother, who has an impressive collection of tableware and glassware, passed down from her own mother. 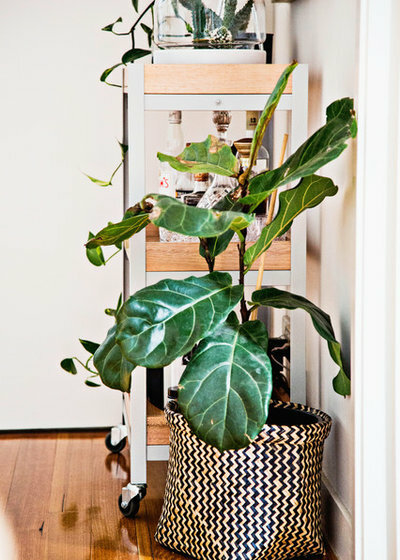 Their plants include fiddle-leaf fig, Boston fern, devil’s ivy, rubber plant, cacti, succulents, Zanzibar gem, passionfruit vines, string of pearls, bird of paradise and herbs. 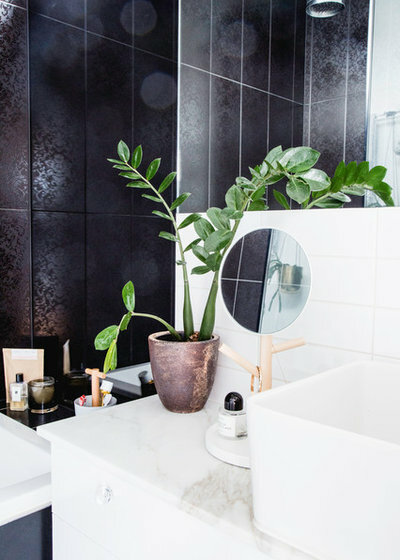 The bathroom off the main living area is well lit, with high windows and black and white tiles keeping the design simple. Plants also decorate this room. 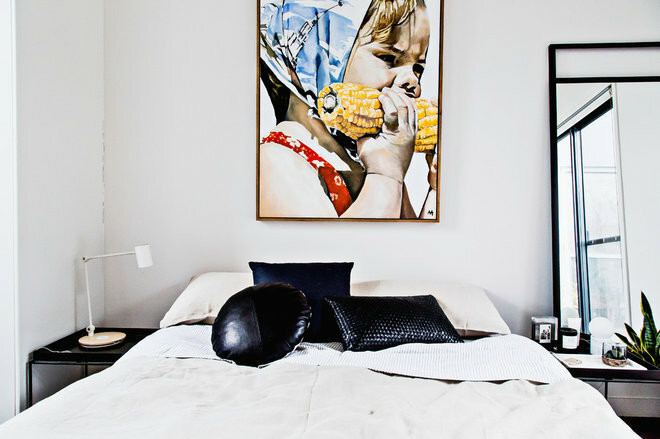 The couple’s bedroom is a calm space decorated with more sentimental pieces, including the Corn Kid artwork by Adoni. It celebrates Rebecca’s love of corn. On a chest of drawers are more of the couple’s mementos. The confetti photo is from their wedding day in Bali in 2014, captured by a friend, photographer Cherrie Eisemann. Rebecca keeps a childhood token on the drawers with an amethyst crystal given to her by her parents when she was 3. A framed photo of Tennessee is a tribute to Rebecca’s love affair with the place, after a recent trip to Nashville. “I must have been a cowgirl in a past life!” she says. 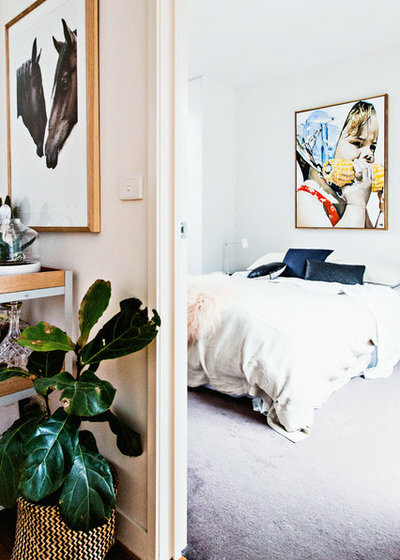 When the couple moved in, big, heavy curtains covered this tall window in the bedroom. They took them down to let in as much light as possible. The window now also provides interesting rooftop views of the surrounding suburb. 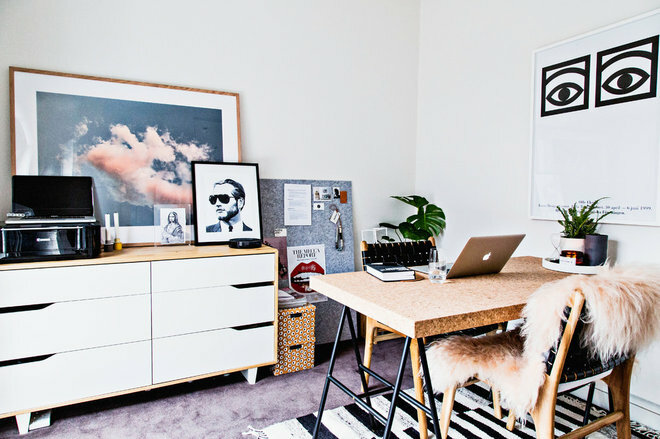 The second bedroom is used as a home office. Rebecca runs her styling business Rebecca Ellie Studio from here, along with Nathan + Jac. The natural light coming in through sliding doors that open onto a private balcony makes it a joy to work in here, she says. 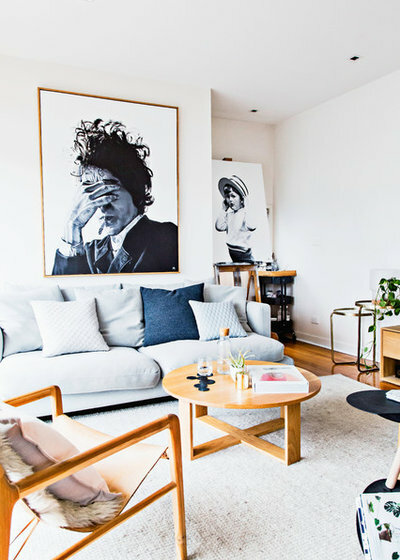 The room looks across to the bedroom and is adjacent to the living room, so all areas of the apartment are visually connected and full of natural light. 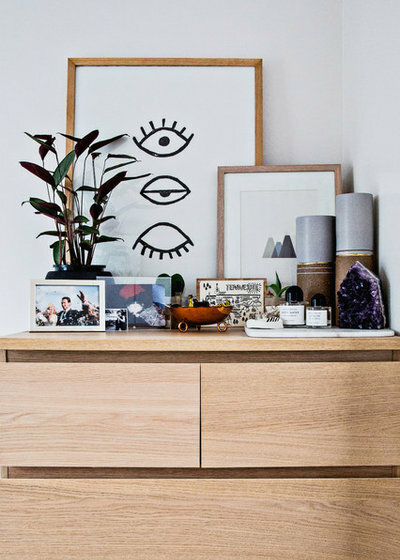 A mirrored storage cupboard in the room keeps clutter at bay. Next to it hangs a tiger illustration, done by a friend, Scottish artist Susie Wright. It was given to Rebecca and Adoni as a housewarming present by another friend. 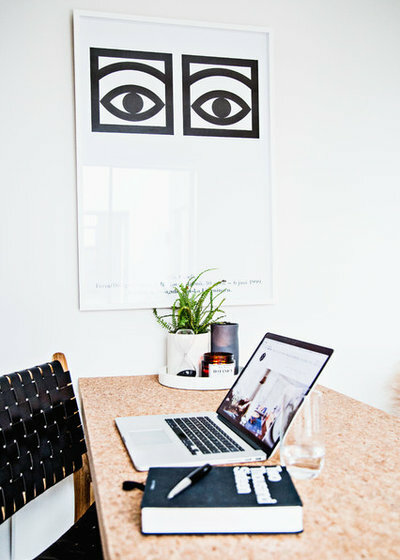 The balcony that adjoins the office is Rebecca’s favorite space: “I love how each room has been built around the central balcony, which gives an airy, happy feel to the whole space,” she says.